Looking Natural Is Just As Important To Us As It Is To You…FREE CONSULTATION TODAY! What is Restylane? How Does It Work? What is Restylane Silk? How Does It Work? What is Restylane Lyft? How Does It Work? A “mid-dermal” hyaluronic acid filler product designed for pronounced facial folds as well as cheek and mid face volume restoration. How are dermal fillers Restylane, Restylane Silk, and Restylane Lyft different? Restylane, Restylane Silk, and Restylane Lyft are all dermal fillers similar in their makeup and ingredients; however they vary in strength and density in order to deliver a treatment outcome ideal for your area of concern. During your dermal filler consultation with our expert injection specialist, we will explain the differences in these injectable dermal fillers and help you select the most appropriate product for your needs. Restylane Lyft is a dense product and can be used in areas that require more volume, like the cheeks. Restylane and Restylane Silk may be more appropriate for the delicate areas under the eyes or around the mouth, and can be directly used to to enhance thinning lips. 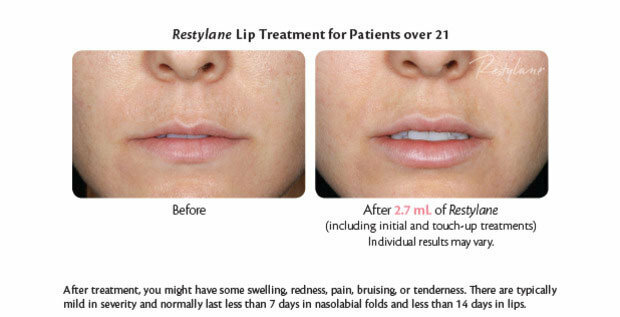 Restylane Silk is recently approved by the FDA for the subtle enhancement of lips, and to smooth fine lines and wrinkles in the area surrounding the mouth. 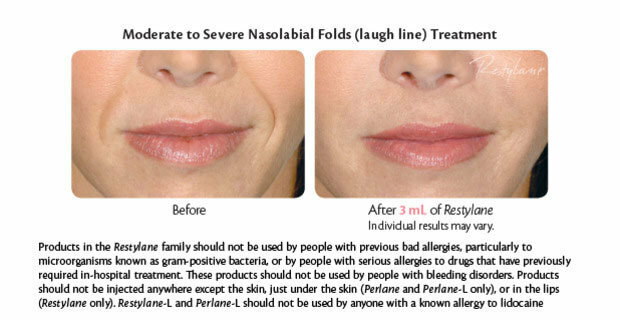 Restylane Silk is a hyaluronic acid filler with a smaller particle size than any filler currently available in the US. It is ideal for loss of shape to lips and mouth area. How long can I expect these dermal fillers to last? Restylane, Restylane Silk, and Restylane Lyft offer immediate results and last an average of 6-12 months. Here at Lucy Peters Aesthetic Center, dermal fillers are sold per syringe and the amount of product (number of syringes recommended) will be discussed prior to your procedure.